The title of today’s post is one of my favorite quotes and seems fitting for my annual post, sharing photos of this summer’s flowers in and around our yard. 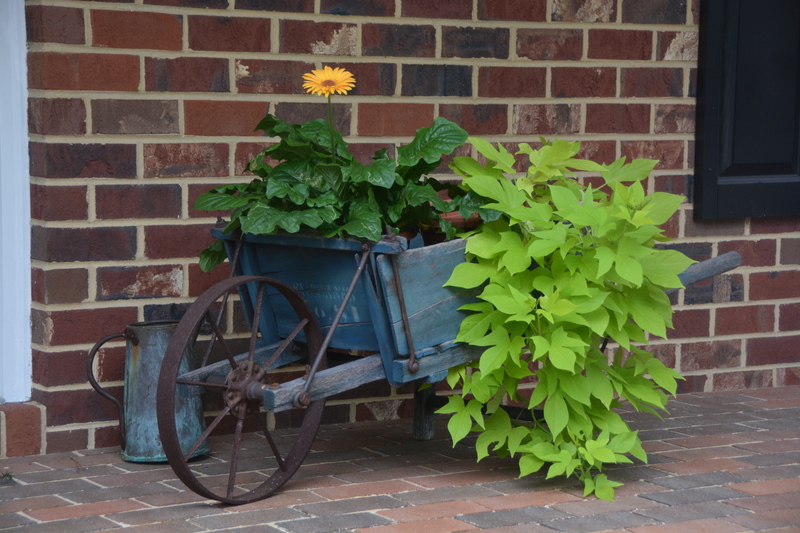 This old wheelbarrow has been a fixture on our front porch for several years. As usual, a sweet potato vine is part of this summer’s display, along with a gerbera daisy, blooming proudly. I love to shop the plant clearance aisles at Lowe’s or Home Depot. 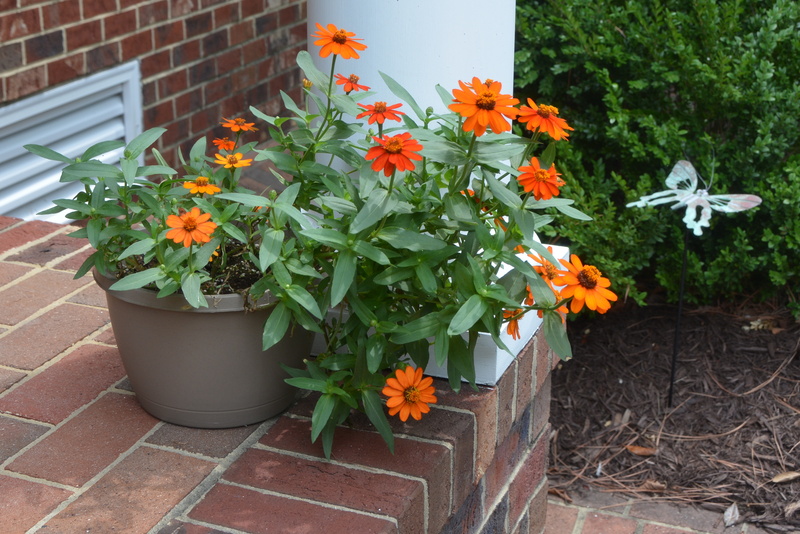 This orange zinnia was on sale earlier this summer for a couple of dollars. It just needed a little love. Speaking of purslane, I love this variegated one that I planted in an old enamel coffeepot. A friend gave me this huge hanging begonia for my birthday. I don’t have anywhere to hang it, so it will have afternoon shade. But it seems content on the deck. 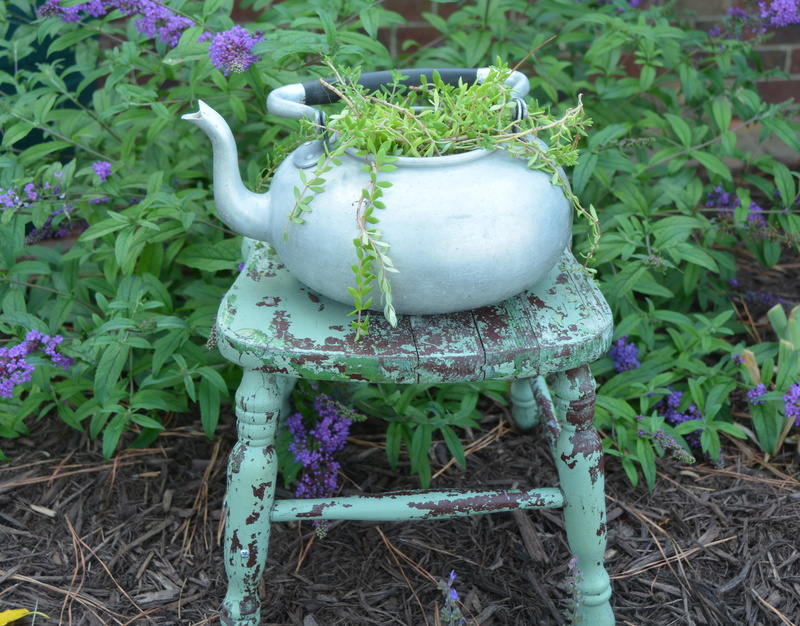 And, last but not least, “that ol moss”, planted in an old tea kettle that I found recently at an antique shop. It’s mine for now, but, in the future, could be a gift for a friend. I’ll miss all these blooms when summer’s over. This entry was posted in Days at Home and tagged begonia, bloom where you're planted, clearance sale plants, gerbera daisy, old wheelbarrow, orange zinnias, petunias, purslane, sweet potato vine, that ol moss. Bookmark the permalink. I love seeing all of your lovely flowers. You have such unusual containers for them. We’ll have to come over before summer’s gone to see them! These are really cute flower images! Have a great day! Beautiful photos……I love “outdoor decorating” with plants…..some can be brought in when it gets cold to live another year – some manage to survive outside and come back on their own….but there’s always next Spring and those sale racks to plug up the vacancies! Beautiful. You certainly do have a way with flowers and decorating with them. Love your happy petunia. I remember your “What’s blooming” that used to be posted along with your family photos. All your flowers are happy and flourishing. Delightful update, Dianna. OH, Dianna, your plants look beautiful and healthy! Love the ideas you have! The big white enamel pitcher with red trim looks wonderful with the purslane in it (what a wonderful word). If I have heard it before I do not remember it. 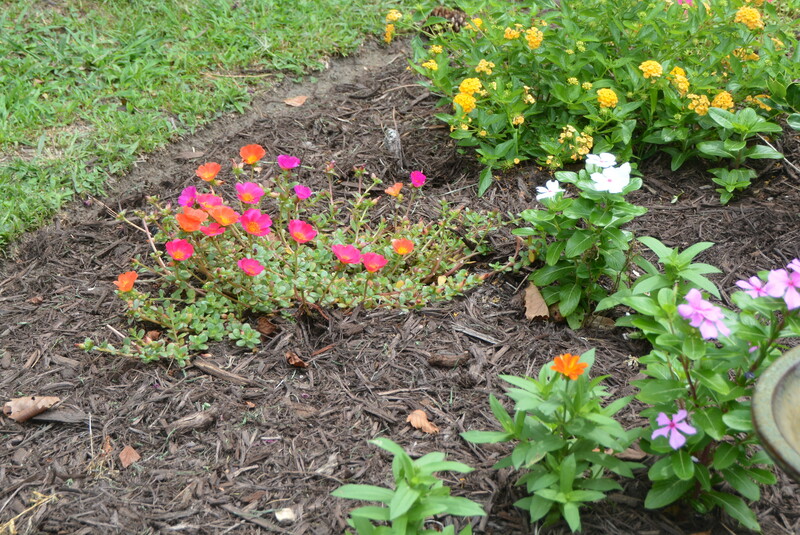 Thanks for sharing your beautiful yard! Beautiful! Love the “clearance” flowers and your creative settings. You have a wonderful talent for growing flowers. Your beauties are a buffet for the eyes. I like that quote too and I agree it fits your post perfectly. I just discovered purslane this summer. 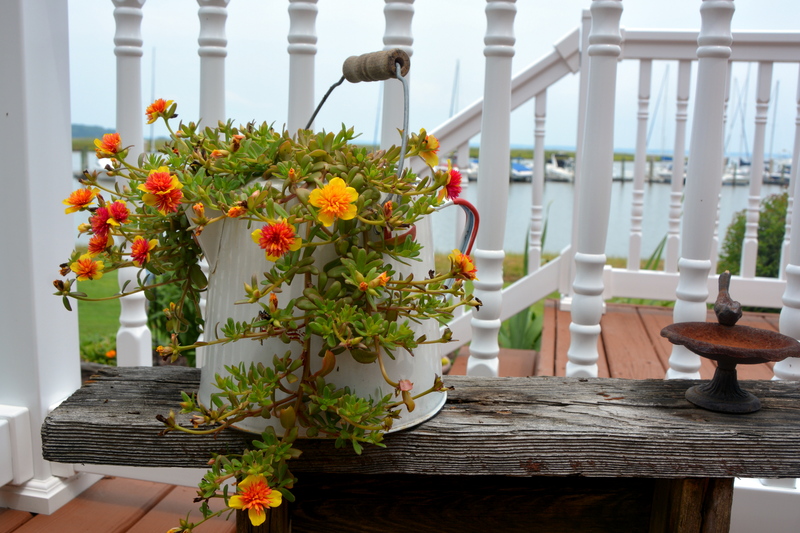 I have it planted in a pot at my house in Kitty Hawk and it has been blooming like crazy all summer. Does it re-seed itself like it’s cousins? Wish my thumb wasn’t brown! 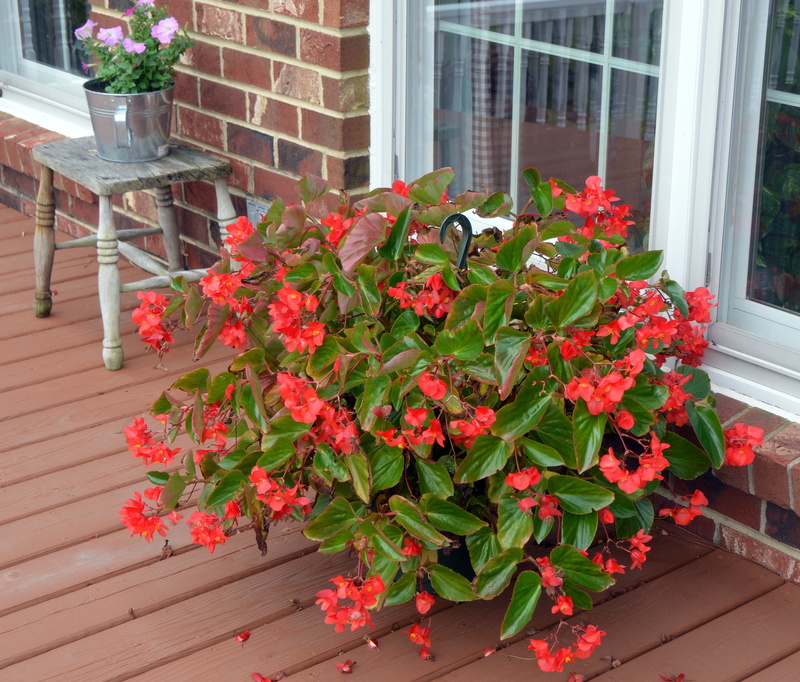 Your rescue blooms show the results of a really talented gardener. Lovely! Such lovely blooms they are too. Your green thumb and creative ideas for planting really come together beautifully. Dianna, you truly have the magic touch. Everything is lovely! Everything in your yard seems to know the phrase as well! Definitely some happy flowers over there! It takes a bit of courage to bring some of those bedraggled Big Box plants home – they don’t look too encouraging sometimes. Nice to see how they can be rejuvenated with a little TLC. “Clearance” is just another word for “needs special love”, and they seem to have found it in you. Beautiful flowers. Mine have done especially well this year – a few ‘clearance’ ones among ours too. So inviting. Had them for years. Didn’t know you could eat them. Oh all of your flowers look so pretty. We’ve had such heat here this summer that the flowers have really suffered. Plus I just haven’t had time to work in them like I should. That ol moss! I remember that. Beautiful pictures, your place looks very happy and colorful. My favorite out of them all is probably the orange zinna. 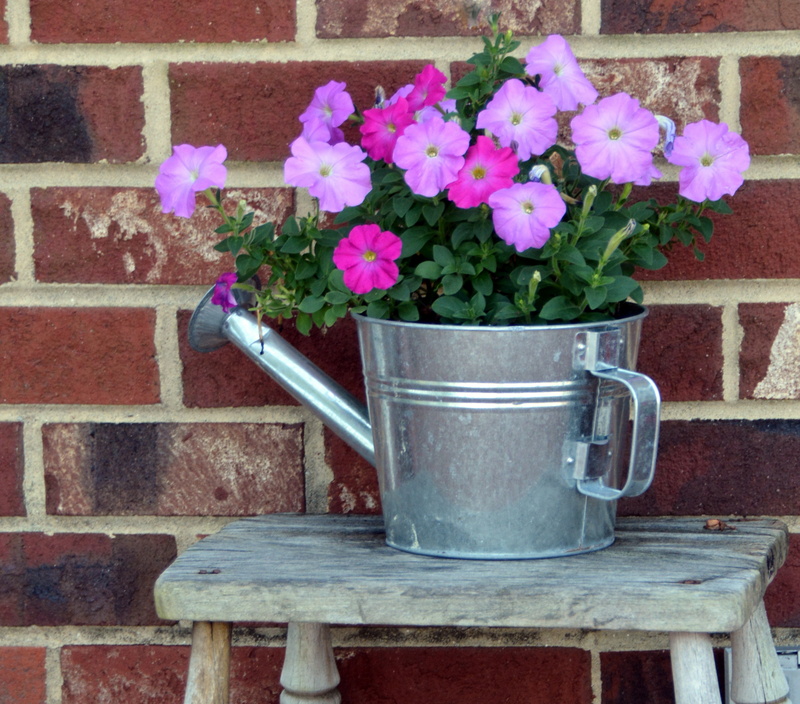 The petunia looks quite happy in that watering can. My sister-in-law rescues the clearance plants, too. Yours all look delighted to have you caring for them.